A Proclamation from Mayor Sylvester Turner’s Office Honors StoneGate Senior Living Facility’s Commitment to Senior Patient Care During August 21st Ceremony. Pathways Memory Care at Villa Toscana is honored to be recognized by proclamation for outstanding service by Mayor Sylvester Turner's office of Houston. National Senior Citizens Day took on special meaning for the award-winning Pathways Memory Care at Villa Toscana when the facility was recognized for outstanding service by a proclamation from the office of Houston Mayor Sylvester Turner. 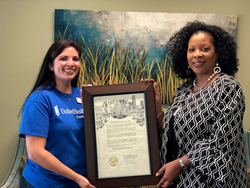 The proclamation was presented during an August 21st ceremony by United Healthcare’s Angie Martinez, who nominated Pathways Memory Care for the honor. The presentation included refreshments for those in attendance and commemorative photos taken of the participants. 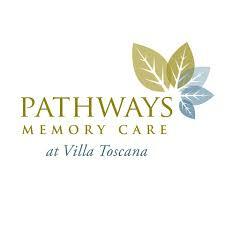 Pathways Memory Care at VillaToscana is a certified dementia capable care distinguished provider and part of the StoneGate Senior Living network of senior care and housing facilities. For more information, please visit: http://www.pathwaysmemorycare.com. Pathways Memory Care at Villa Toscana is a state-of-the-art, luxury memory care community dedicated to providing highly personalized, unsurpassed care in a therapeutic environment that honors the dignity and individuality of each unique resident. At Pathways, we realize that each resident who requires dementia or Alzheimer's care has a unique story, background and set of needs. Pathways recently added unisex (all-female & all-male) secured units to the memory care facility. Our team members provide personalized care daily so that changes in a resident's health or behavior are detected early, ensuring the best quality of life and health for each individual resident. StoneGate Senior Living is an award-winning, full-spectrum senior care and housing company with 46 properties across Texas, Oklahoma and Colorado. Recently ranked as the nation's 31st largest transitional and long-term care company by Provider magazine, StoneGate is a fully-integrated, post-acute health care company, with service lines and business units that offer transitional care, long-term care, assisted living, memory care, rehabilitation, wellness, pharmacy, care navigation and post-acute analytical services. For more information, please visit http://www.stonegatesl.com.